By Sarah Franklin and Dustin J. Myers, CSA Ocean Sciences Inc.
Marine scientists used to spend weeks or months in the field conducting surveys and mapping and imaging the seafloor—not to mention the time it took to distill, merge, and analyze datasets. Today, however, new video technology provides an easier way to survey and analyze large or previously inaccessible areas. Using the ArcGIS Full Motion Video add-in, marine scientists at CSA Ocean Sciences Inc., a marine environmental consulting firm and an Esri Silver Tier partner, integrate biological inventories with video imagery and location information to quickly and accurately appraise fish, coral reefs, ocean pipelines, and other marine features. Full motion video (FMV) covers vast spaces efficiently and improves the accuracy of species and habitat identification. Not only can videos be paused and rewound, but unlike older technologies in which static time, latitude, and longitude were burned into the digital image, GIS also automatically provides the spatial and temporal information associated with the video. Marine video data can be collected in a number of ways. For deepwater habitats, CSA combs the ocean floor using remotely operated vehicles (ROVs) controlled by scientists on support vessels, since ROVs can reach far greater depths and stay submerged longer than human divers. 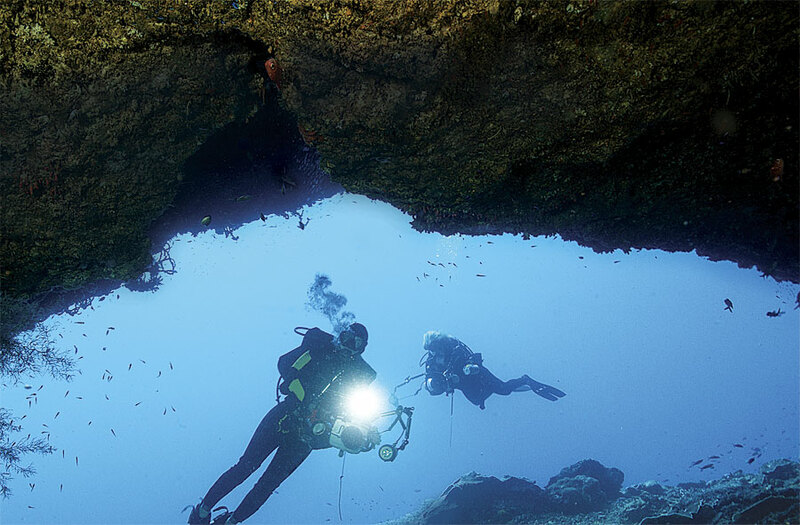 For subsea features in relatively shallow water, such as pipelines and coral reefs, CSA does have divers carry cameras or mounts cameras and imaging systems to the hulls of support boats and other underwater equipment. For shallow habitats and surface features, such as shorelines and coastal wetlands, CSA uses unmanned aerial vehicles to collect aerial images of the areas. Users can trace objects in a video, such as this SUV, so they appear as polygons in ArcGIS for Desktop (as on the right). Using the yellow field of view bounding box, users gain a better understanding of the geographic scale of their videos. With all these methods, navigation is recorded at the same time as the video—either by a separate GPS device or using software within the camera. Navigation can be synchronized with the video during postprocessing back in the office or in real time in the field using special video-encoding hardware, which produces full motion video that's immediately compatible with the ArcGIS Full Motion Video add-in. Users can then view the video track line and digitize geographic features as the video plays. With minimal training in geospatial analysis, people with no previous experience in GIS can easily use ArcGIS Full Motion Video. GIS analysts at CSA developed feature templates in ArcGIS for Desktop that scientists use to conduct detailed fish counts, map habitats, and classify submarine flora and fauna. These feature templates include drop-down lists that ensure data is recorded consistently. When marine scientists return with a survey video, if the navigation data still needs to be synchronized, they use an FMV converter package that CSA developed to automatically integrate video and navigation data for use with ArcGIS for Desktop and ArcGIS Full Motion Video. The package lets users do batch calculations on the navigation data, inject the spatial information into the videos, and export a product that's ready for ArcGIS Full Motion Video. Underwater video is often recorded continuously, so it can be cumbersome to pinpoint relevant sections of the video for analysis. To help scientists quickly find important locations, such as the start or end points for a survey, CSA's FMV converter package also creates bookmarks using point locations that are either provided ahead of time by GIS staff or collected in the field and matched to the navigation data. Linking the video to these navigational bookmarks helps scientists select a specific point of interest and view video track lines in relation to those points using ArcGIS for Desktop. For each survey, GIS analysts create a map document and load the videos into ArcGIS Full Motion Video, along with the feature templates for each feature being surveyed, such as fish or coral species. Using ArcGIS for Desktop, scientists with minimal GIS training can manually digitize data in real time as the video records or later using video playback, immediately creating a geospatial dataset with an attribute table. 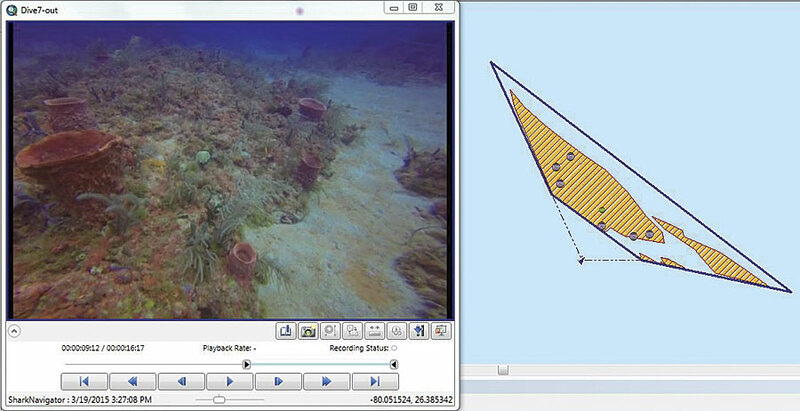 In this full motion video, playing in ArcGIS 10.3.1 for Desktop, the field of view of the camera is shown by the dark blue trapezoid on the right. Users can click inside the video to digitize species and habitat types, which appear as points in the screen on the right. To do this, scientists open the map document and play the video in ArcGIS Full Motion Video. As the video plays, a locational pointer traces the camera's path in ArcGIS for Desktop. A track line showing the camera's trajectory is automatically drawn in the map document, allowing users to clearly see the camera's path. Background features, such as imagery, bathymetry (water depth), and survey points, can be loaded into the map document to aid in orientation, analysis, and visualization. At this point, users can begin an editing session. They then use feature templates to digitize features—such as submarine cables, fish and coral species, ocean bottom types, shoreline shape, and coastal habitat types—by clicking in the video window or on the map document to record feature locations. A significant challenge of traditional full motion video analysis is that it is difficult to estimate the scale of the video. Without accurate measurements of the camera's field of view, the extent of quantitative analysis that can be conducted (such as feature density and video coverage area) is limited. To address this issue, CSA utilizes an upgrade it created for the FMV converter package for ground-projected instantaneous field of view, which provides users with a continuous guide to the scale and orientation of the video image. This is an advanced component of the FMV converter package that can be used with video encoders in the field or during postprocessing in the office. Its custom algorithm calculates the size of the camera's field of view and inserts the result into the navigation file before it is embedded in the video. When the encoded video is played with ArcGIS Full Motion Video, a box is displayed on the image representing the camera's field of view. The box dynamically changes as the camera's angle and location change, so the field of view can be calculated for each video frame. The field of view bounding box can be overlaid onto any ArcMap feature, such as multibeam bathymetry, satellite imagery, survey points, or infrastructure features. Additionally, users can estimate the accuracy of the bounding box by comparing bounding box coordinates to measurements of known physical features in the survey area or an intentionally inserted object whose dimensions are known. With this understanding of field of view, users can make advanced calculations of survey areas and observed features using ArcGIS for Desktop, Portal for ArcGIS, ArcGIS Online, and other mapping applications. To CSA's scientists, this approach has been useful for evaluating fish density in both shallow and deep-water coral reef habitats, assessing the integrity of underwater pipelines, and classifying different kinds of reefs and types of ocean floor. The integration of video technology, GIS, and custom programming provides marine scientists with the opportunity to observe and analyze the benthic environment in ways that were previously impractical. ArcGIS technology—especially the ArcGIS Full Motion Video add-in—provides exciting opportunities for marine scientists to collect, visualize, and efficiently analyze environmental data and reduces the need for postsurvey data entry. For more information, visit CSA's website or contact Sarah Franklin, geospatial coordinator at CSA Ocean Sciences Inc., at 772-403-6098.